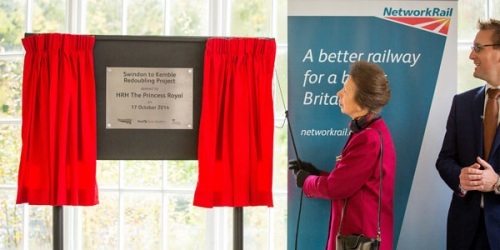 The Princess Royal has officially opened the newly redoubled railway line from Kemble to Swindon. This is an important transport link for those who will arrive at the station having completed the walk from London. The station is very handy for the Thames Source but in recent years many have had a long wait in the lovely station. On Friday Her Royal Highness arrived at Kemble on a train at the early hour of 9am. There was plenty of Network Rail and First Great Western staff on the platform to greet the Princess and her husband Sir Tim Laurence. “Now that work on the line is complete, passengers can look forward to fewer delays and reduced journey times in the future,” said Network Rail’s Western Route managing director Patrick Hallgate.